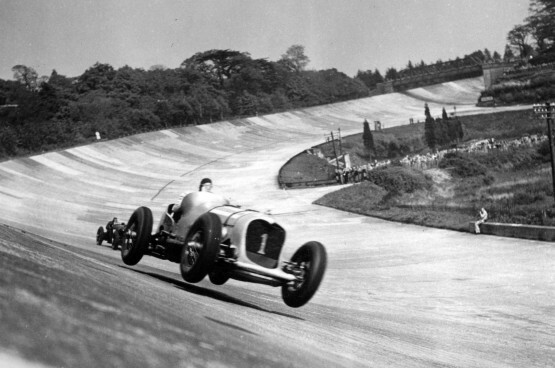 Brooklands is a disused motor racing circuit and airfield just 20 miles south west of London near Weybridge. It now houses the Brooklands Museum and Mercedes World with many of the old buildings and track reinstated to their former glory. Work commenced in 1906 and in June 1907 the world’s first purpose built motor racing circuit was opened. Due to the difficulty at the time of laying tar macadam on the steep banks, the track construction consisted of gravel overlaid with concrete in order for the steep banks to be cast in shuttered sections. In 1937 the Road Racing Circuit, designed by Malcolm Campbell and built of similar construction, was added. At the outbreak of the Second World War in 1939 the whole site was devoted to the production of warplanes and the circuit’s condition deteriorated during this period. It was finally sold to Vickers-Armstrong for aircraft production and in 1987 it became Brooklands Museum. The Malcolm Campbell Circuit is classed as a scheduled monument and 100 years after Brooklands opened, we were awarded the contract to repair parts of the concrete track. Gifford and Partners produced the ‘Specification for Works in Relation to Scheduled Monuments’, which included a performance specification for the concrete based on the original construction. As the aggregate used in 1937 was not available from the original source a similar alternative flint material was found in a quarry in Norfolk. Our concrete technician was then able to design the mix to match that of 1937. Defective concrete was removed by electric hand breakers and edges square cut prior to the installation of a DPC, spacers and mesh. Due to the small quantities required each day and limitations imposed on the access to the track, site batching was considered the most economical option. Once cast, the repairs were cured with polythene sheeting in accordance with the specification.